It takes five men to haul a 420-pound tombstone off a truck and then down multiple staircases to the gallery. Artist Brian Whiteley is sweaty and feverish apologizing for his flu. After nearly two months, he finally received his most widely recognized artwork from a police evidence depository. 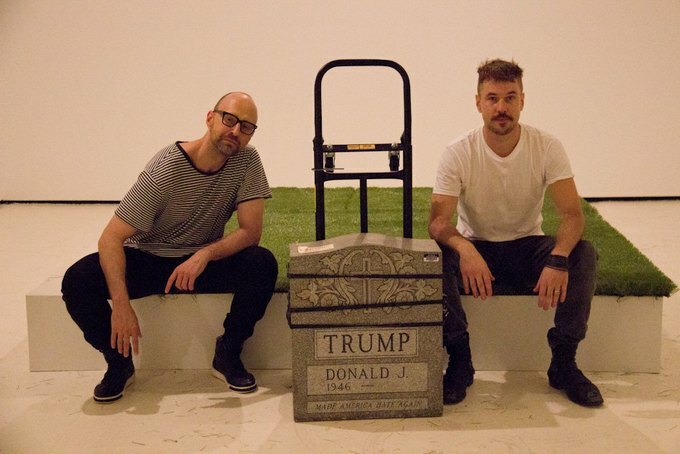 One of the most controversial and viral pieces of art of the past few months, Donald Trump Tombstone, which was originally found planted in Central Park back in March, has arrived to Bushwick and you can go see it tonight. 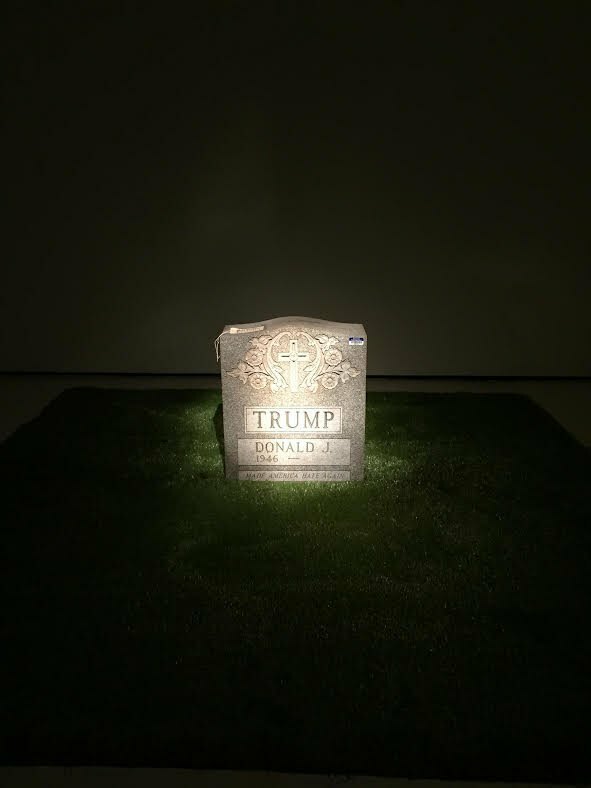 Presented by Christopher Stout Gallery, artist Brian Whiteley is showcasing his work -- "Legacy Stone" known colloquially as the Trump Tombstone at Brooklyn Fire Proof at 119 Ingraham Street. The piece will be on view tonight from 6 p.m. to 10 p.m. and then again during Bushwick Open Studios weekend (October 1-2). Back in late March, when still several Republican candidates vied for the presidential nomination, one had already managed to clearly distinguish himself from the rest of them. Unfortunately, not by closing the gaps or bringing people together but through the hate speech along his campaign trail. In Brian Whiteley's opinion all that Donald Trump did was making America hate again. And so in hopes to cause Trump to rethink the legacy he was leaving behind, he decided to create a radical piece of art. 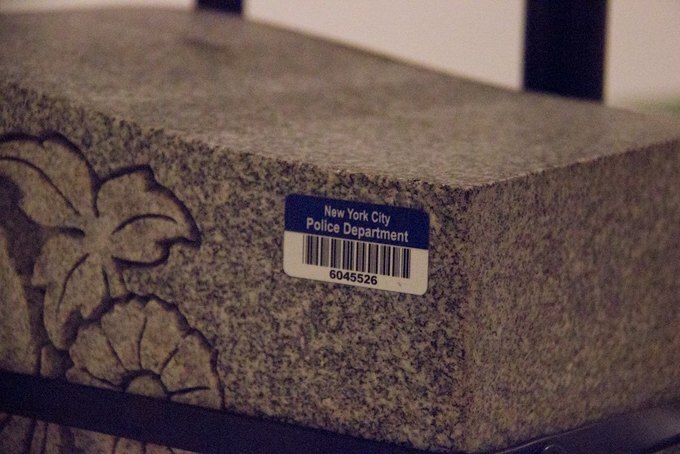 He ordered a tombstone from a Brooklyn headstone shop and under the veil of the night and with a little help from his friends, he planted the massive stone right in the middle of the action -- at Sheep Meadow in Central Park. 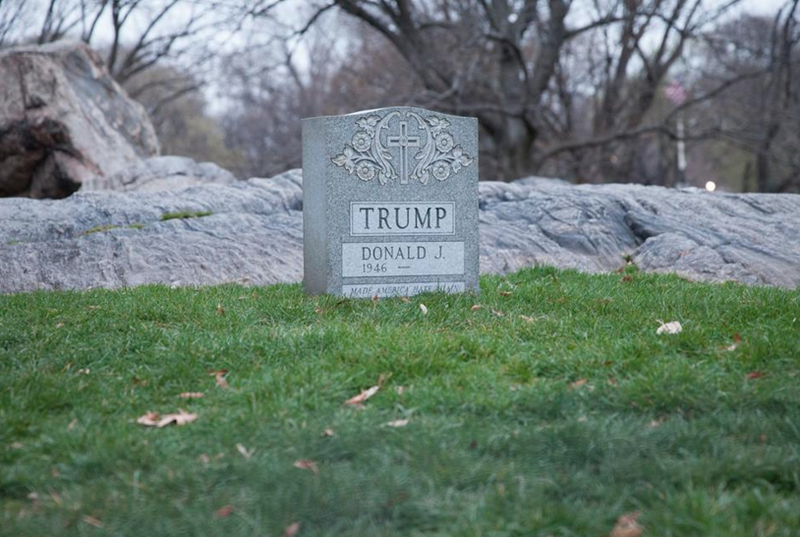 The piece -- though short-lived at its Central Park location -- went immediately viral. Park visitors and media alike were guessing who was responsible for this stunt. The Parks Department removed the heavy piece -- very likely cursing the anonymous artist -- and police as well as secret service started to investigate the matter. Fortunately, the officials determined that Whiteley wasn't a potential presidential candidate assassin and he wasn't charged with a crime. "I planted the piece and an immediate strom started in the media," Brian told us during our Facebook live interview this past Wednesday. When he learned about the secret service investigating the matter, "the world collapsed" around him. He just recently became a father and so the motivation to stay out of jail was that much stronger. On some of the days, he told us, he left his house feeling like he was a part of an action movie wondering if he was being monitored and chased by the government. He hired a lawyer who advised him to make a public statement that this wasn't a death threat to Donald Trump as many of the right-wing publications declared. And so he talked to the Creators' Project and to Gothamist providing both publications with an incriminating photograph. "The project unfortunately still rings true," told us Brian Whitely. "There is still a lot of hateful rhetoric in his campaign. I was hoping that maybe he would change his ways through this project … through visualizing his own death but he has not." "Fine artists and contemporary artists have always been an integral part of the political dialogue and have a lot to do with informing and shaping the political tones of this country," explained gallerist and artist Christopher Stout. "Example of this in the last election cycle was Shepard Fairey and his portrait of President Obama." Brian Whiteley is not a newbie to public stunts as art. He walked around Prospect Park in a Bigfoot costume trying to generate "new mythologies through [his] characters and starting conversations in the public forum about paranormal experiences," among other projects. Christopher Stout Gallery takes pride in showing difficult and subversive works of art. Their other widely discussed project included artist Lisa Levy sitting in a gallery naked on a toilet for a whole weekend. Cover photo: courtesy of Brian Whiteley and Christopher Stout Gallery.